Winery owners are rich, self-important snobs with no established connection to reality. They hire relatives to run their wineries whether those relatives know anything about wine or not. Wine country tourists are boorish inebriates who think grape-picking is glamorous. Wine-industry marketing executives think that successful winemaking is all about sitting down and thinking up advertising ideas. Wine country fundraisers boast idiotic slogans like "Helping Africa has never tasted so good." Vineyard managers are potentially psychotic. Winery managers are clueless and high-strung. Ostriches, and other colorfully ill-advised winery attractions, pretty much bite. Please calm down. These are not accusations. They are plot points. In the hilarious new mockumentary Corked , made by Sonoma County wine-industry insiders, nothing and no one is spared from the razor-sharp, brilliantly knowing gaze of the camera. Imagine Waiting for Guffman set among sun-drenched vineyards, atmospheric wine caves and million-dollar tasting rooms. Throw in an obsessive-compulsive winemaker, some rude tourists, a number of billionaires, the de rigueur crazy people, a few loud explosions, one or two mobsters, some epic wine spitting and those damned ostriches, and you have Corked , written and directed by Healdsburg's Ross Clendenen and Paul Hawley (a tasting room "ambassador" for Bella Vineyards, and the son of legendary Sonoma County winemaker John Hawley, respectively). The film, shot in Sonoma County during the 2005 harvest and edited over a long three-year process rife with its own drama and comedy, has its world premiere next weekend at the cozily wine-centric 2008 Sonoma Valley Film Festival, running April 9&–13. The filmmakers and much of the cast will be in attendance. "Most people at the festival are going to love the movie," says Clendenen, a Healdsburg High School graduate who studied film in Southern California before returning to Sonoma to pursue his dual passions. "And one or two other people," he adds with a laugh, "are going to be offended—maybe more than one or two." Scheduled for the festival's popular lounge venue ensconced within the Sonoma Community Center, Clendenen and Hawley's fast-paced satirical comedy is expected to be one at the hits of this year's festival, precisely because it might offend a few people. "As critical and satirical as we are with all of this stuff," Clendenen says, "there's a lot of affection in the film, too. We love this business. We wanted to show as much of the actual process of winemaking as we can, in a relatively realistic way, while poking fun at the craziness and outrageousness that sometimes occurs." With a budget equal to the cost of "a pretty good new car," Clendenen says that he and Hawley, along with producer Brian Hoffman, set out to make a film that didn't look low-budget. The filmmakers began with a large, detailed script that contained an extremely large plot. "It was like the Lawrence of Arabia of mockumentaries," he laughs. "But then we ended up just focusing on our favorite parts and letting our actors improvise a whole lot, and that became the film. In the end, we just fell back on the script when the improvs weren't working, which wasn't very often." The film focuses on four wineries located in the Dry Creek region of Sonoma County, various characters competing for the all-important approval of a high-powered wine critic and for a first-place trophy in the fictional Golden Harvest Award festivities. Petaluma actor Jeffrey Weissman—known to local theatergoers and anyone who's seen the films Pale Rider, Back to the Future II and III, Twilight Zone: The Movie , and, ahem, Sgt. Pepper's Lonely Hearts Club Band —plays Jerry Hannon, a winemaker with his sights set on winning the coveted Golden Cluster trophy. His character is based on John Hawley, the father of co-writer and director Paul Hawley. 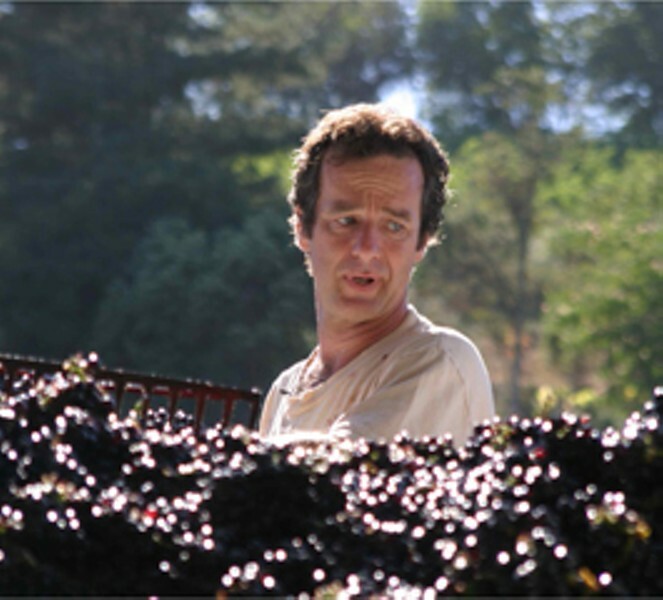 John was the very first winemaker at Clos du Bois, and as the chief winemaker at Kendall-Jackson from 1990 to 1996, helped that company rise from producing 600,000 cases of Chardonnay a year to over two and a half million cases annually. "John gets very . . . neurotic, shall we say, during harvest, and Jeffrey captured that. We would literally pull John out of the real winemaking production process, if he was shoveling grapes into the hopper or something, and we'd put Jeffrey in there instead, shoot him doing what John does, and then let John go back to doing his thing." "It was amazing, I had my character study right in front of me," Weissman says, anticipating that Corked could prove to be a breakout role for him. Weissman also credits his wife, Kimball, who manages the tasting room at Freestone Winery, for interpreting the wine-speak and stream-of-thought vintner trivia that was a part of his character. "There is always homework in making a movie," he says. "There's research that an actor has to do to prepare for his part. But in my case, my research was handed to me on a golden platter." None of that prepared Weissman for some of the winemaking activities he had to pull off, including driving an ancient tractor, scaling enormous fermentation tanks and climbing inside a closed-quarters storage tank. "I overcame claustrophobia to do that one," he says. "I did a lot of breathing exercises." Now that the film is complete, with the big film-festival premiere set for next weekend, the filmmakers are setting their sights on selling Corked to a national distributor. "I think we have a shot," says producer Hoffman, "because I think we have something unique, we have something funny, we have something smart and we appeal to a wide range of people. I think this film will really be a hit among wine drinkers, and may become a cult hit among that demographic." If the film does reach the levels of success Hoffman sees as achievable (and why not? Corked is funnier than the last two Christopher Guest films put together), he believes that success will be largely due to Weissman's performance. "Without Jeffrey, we wouldn't have as funny a film as we have," Hoffman says, "and it's a very funny film." 'Corked' screens Friday&–Saturday, April 13&–14, at the Ravenswood Lounge within the Sonoma Community Center, 276 E. Napa St., Sonoma. 3:30pm. $10. 707.933.2600.